When it comes to finding gear for your specific trip, you don’t need to necessarily splurge on some items. Many items you may be able to borrow from friends and family or find at the back of your own closet. But if there’s a few things you need that you don’t want to pay full price for, you should look at your local thrift store or op shop. Not everything should be purchased secondhand, namely undergarments, but you’d be surprised what you can find gently used. You can also check out secondhand sports like Play It Again Sports in the US and my local secondhand outdoor store, which sells everything from hiking boots to tents to clothing, some with the tags still on. Are you going to New Zealand or hiking the Appalachian Trail? It’s easy to get caught up in the name brands at your local outdoors store, but you can easily find a pullover fleece or rain jacket at the thrift store. The quality is of the same level as you’ll find for double the price. I especially recommend buying jackets from the thrift store if you’ll only need it for part of your trip, like one leg of your round-the-world adventure. I knew I’d be volunteering for part of my recent travels, so I didn’t pack any t-shirts that I wanted to keep. If you’re spending time in the Peace Corps or are just traveling somewhere that you’re bound to get grubby, it doesn’t hurt to buy some basic t-shirts from your thrift store that you can throw away or donate later. Choosing what shoes to travel with is difficult enough, but if you’re not doing anything that requires a specific pair of shoes, you can purchase them secondhand. I don’t recommend buying secondhand hiking boots, as you want them to shape to your feet, but pairs of flip flops, rain boots or basic tennis shoes are fine to buy. My sister found a pair of almost new Chacos at her local store in her size, so you never know what you’ll find! I always travel with some sort of hat, typically a faded baseball hat, to keep the sun out of my eyes and hair out of my face. If you don’t have one at home, this is an easy item to pick up at the op shop. Cold weather items like gloves and scarves are good finds as well and should cost you less than $5. I’ve also spotted cosmetic bags and small purses that are great for long term travel. If you travel with a hair dryer or straightener, you can also find travel sized varieties secondhand for very cheap. Just make sure to plug it in at the store before bringing it home to be sure that it works. If you’re trying to make your own sleep sheet but don’t want to spend more than $5, head to your thrift store, which always sells home products. You can also buy a bag to turn into a camera bag or little items you may need like a wine bottle opener, a travel water bottle or a cheap pair of headphones. I also have had great luck buying books for less than $3 if you don’t have an e-reader. >> Check out other ways to score bargain travel gear or where to buy travel gear that you’d least expect. 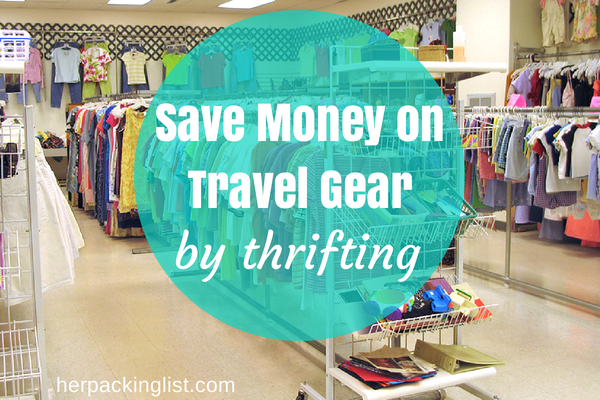 Have you gone thrifting for travel gear before? What finds can you share? I buy a lot of gear second hand, and think it’s a great idea for lots of reasons. A word of caution though – weatherproof gear has often lost its waterproofing, so be prepared to fix that, (I had a very soggy weekend at Glastonbury music festival thanks to a second hand raincoat) This also applies to tents, which may be missing bits, so factor in the cost of repairs. In the UK, if a charity / second hand shop sells electrical goods, they have to be PAT tested so you can be pretty confident they’ll be safe & in working order. Bizarrely, I find that op shops / charity shops often have better plus size selections than local stores, so they’re a good choice for us larger folk. In Australia, try Aussie Disposals – it’s an army surplus store so often super cheap, and has a great range of outdoor and camping gear!